Radio wasn’t always kind to Julius Marx. Better known to the world as Groucho, Julius and his brothers were pushed into show business by their mother, Minnie Marx, who hoped her sons would find their fortune like their uncle Al Shean of Gallagher and Shean. The brothers began their vaudeville careers as a singing group, and were incredibly mediocre. During a particularly dispiriting performance in Nacodogches, TX, the boys began exchanging wise cracks on stage to entertain each other. Like many vaudeville comedians, they found the audiences had a great deal more appreciation for the jokes than the songs. The Marx Brothers comedy team had great success in vaudeville and the movies. 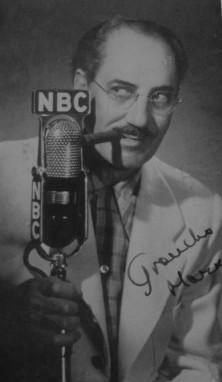 Julius, now much better known as Groucho, wanted to make a splash on radio as well, but never found the right vehicle. An early effort, Flywheel, Shyster, and Flywheel(1932) was scuttled by a poor time slot and the brother’s movie commitments. In the mid-40’s Groucho starred in the Pabst sponsored Blue Ribbon Town, but the show never really took off. The concept that would eventually become Life of Riley was initially developed with Groucho in mind, but the sponsor couldn’t accept the wise cracking Groucho as a family man, and the role was turned over to William Bendix. 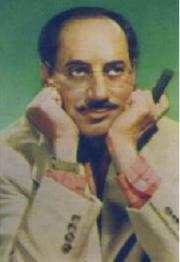 One of those who laughed the hardest was the show’s producer, show had a brainstorm of putting Groucho in the role of a game show host and turning him loose. Groucho took some convincing, noting that quiz shows were the refuge of washed-up actors. However he was also aware that with the state of his radio career, he had little to lose. The program, You Bet Your Life, became a success by any measure. 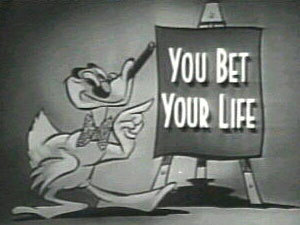 The show premiered on ABC in 1947, then moved to CBS for the 49-50 season, and finally landing on NBC radio in 1950 and lasting for the next ten years. NBC realized that the show was simple enough that it could easily be shown on both TV and radio, and the TV version ran until 1961. It later became the first TV game show to make money in syndication. You Bet Your Life was supposedly a quiz show, but the real appeal was simply allowing Groucho to play Groucho. Although insults were a big part of his routine, Groucho was ultimately kind to his guests, often employing a “give away” question like “What color is the White House” for contestants who hadn’t won very much. The show was prerecorded for two reasons. First of all, not every joke worked, so by prerecording the producers were able to select the best laughs. But most of all, Groucho was a well known loose cannon who could and would say almost anything on the air. An urban legend has grown from this, known as the “Cigar Incident”. Groucho was interviewing and contestant who had 11 children. He asked why she chose to have such a large family and she replied “Well, I love my husband”. 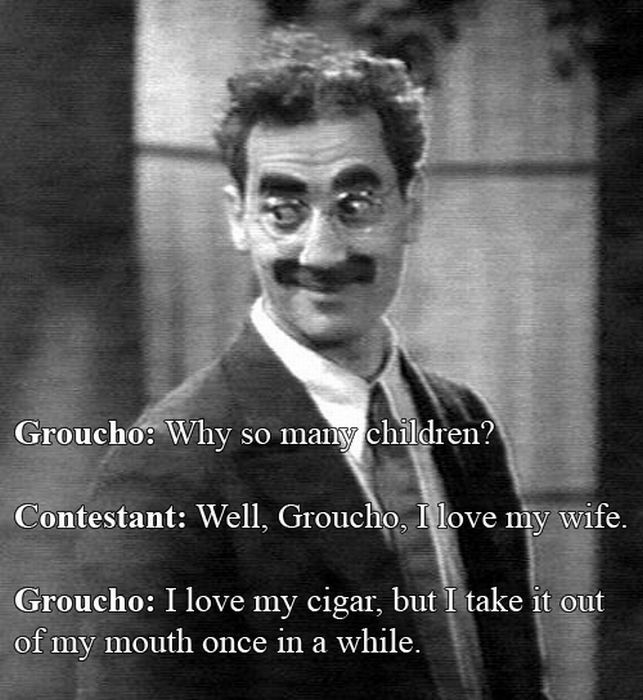 Groucho supposedly came back with “I love my cigar, but I take it out of my mouth once in a while!” Groucho denied ever saying it, and if it happened, there is not recording of it. However, according to the legend, whenever an NBC program needed explosive laughter on a laugh track, the Cigar Incident laughter was used. This entry was posted in Bob Hope, Comedy, Old Time Radio, Quiz Show and tagged Groucho Marx, You Bet Your Life. Bookmark the permalink.